Harvesting: Hungry? More summer veggies should be ready to harvest! 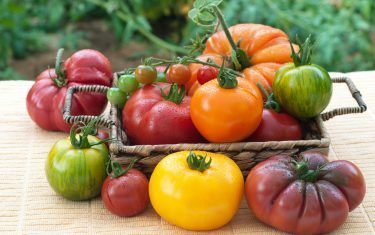 Tomatoes, peppers, and onions are ripe for the picking so bring some inside if you have them and put together a fresh garden salsa. Structure: Structures support your precious plants so give them a little support, in turn, by checking to make sure they’ve survived the season. If stakes, trellises, and other supports have budged, collapsed, or deteriorated, try to address these issues before they get any worse. Mulched shrubs: Shrubs need some distance from mulch in order to develop strong stem tissue. Encourage shrubs to grow by doing away with 2 to 3 inches of the mulch that’s accumulated around the bases of their stems. Roses: The best gardening tips are the ones that give you less work to do instead of more. Once it’s August, feeding roses actually does more harm than good. They need time to strengthen before winter arrives so you can stop fertilizing them now. Pruning: Some more good news! You can also stop pruning many of your plants at this time. Many plants that bloom during the spring and summer need their new buds so they can flower next year. Evergreens don’t need to be pruned either because any new growth will just die come winter at this point. August flowers: If you want to add more plants to your yard, you can still do so, even in August. Varieties of flowers like Black-eyed Susan, Russian Sage, Yarrow, and Threadleaf Tickseed actually do well during the hot summer months. Clean up: Picking up after your plants isn’t the most fun job in the world, but it will pay off in the end. Allowing seeding weeds to stick around in any capacity may result in reproduction, which will spread these nuisances all over your yard. Avoid disease and pest infestation by ridding your yard of culprits that attract one or the other. Throw away rotting produce as soon as you can and pick up fallen leaves from roses and peonies. These types of leaves have a tendency to become infested over the winter. Avoid pesticide: Tidying your yard is the first step to avoiding having to use pesticides. Another way is to take the time to diagnose the issue so you can brainstorm alternative solutions based on the specific problem. Extreme temperatures, waterlogging or drought, and lawnmower damage can all hurt plants. These issues can be resolved without the use of pesticides. Vacation: Gardens are relaxing. Vacations should be too, but they aren’t when traveling gardeners are worried about their plants back home. Give yourself peace of mind by asking neighbors, friends, or family members if they wouldn’t mind watering your plants while you’re away. Other strategies for maintaining the health of your plants while you’re on summer vacation involve water timer attachments to hoses and sprinklers. Lawn: When the weather starts to cool, lawns are ready for revitalization. Core aeration can do wonders, especially if your yard is looking rough thanks to warm weather foot traffic. If your lawn has clay soil, it’s a particularly good candidate for this specific process. Fall plants: Say goodbye to summer and hello to autumn! Think ahead and generate some ideas for how you’d like to dress up your yard and home for the fall season. Blooming plants like mums and asters should be out soon, prepped for browsing and purchasing. Perennials: Put some thought into the arrangement of perennials in your yard. Once fall officially arrives, it’s the best period to transport and divide perennials. If you already have everything planned out ahead of time, your perennial process will be a breeze!